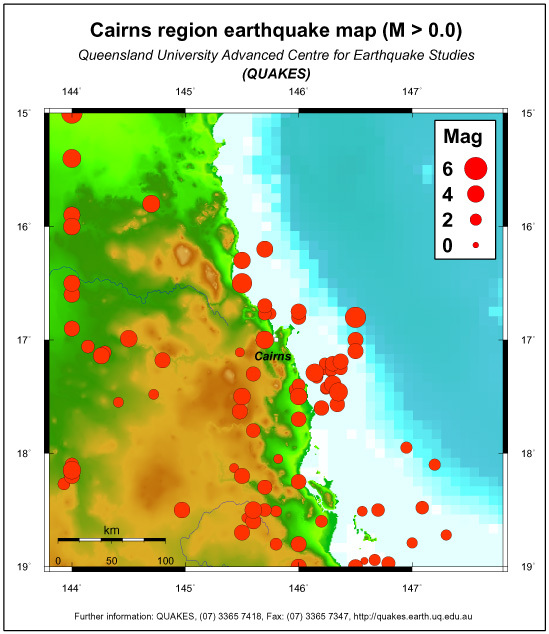 The Queensland catalog contains a total of 287 earthquakes in the Cairns map region. The largest recent events in this area had Richter magnitudes of 5.3 and 5.0 (magnitude 5 earthquakes have the potential to cause serious damage or fatalities). Both these events struck within about 80 km of Cairns. Shown here are Richter magnitude ML > 0 events. The seismic network near Cairns contains too few seismographs to detect most smaller earthquakes. This is problematic because low level activity is needed to properly analyse and forecast the hazard for mitigation and preparedness purposes. A reassessment of the earthquake hazard in Queensland conducted by UQ in 1996 suggests that the Mackay to Cairns region may be one of the higher hazard parts of the state although uncertainty remains high due to the data limitations.